﻿ About Us_Beijing Booming HighChem Technology Co., Ltd.
HighChem Company Limited was founded in Tokyo in 1998. The predecessor of the company 21th Century Company Limited was established in 1993. Since its inception, the company got rapid development and has set up branch companies and offices in Shanghai, Chongqing, Tianjin, Beijing, Guangzhou, Jiangsu and Atlanta, America. The company also successfully promoted the 20,000 ton hydrazine hydrate and ADCA foaming agent project. HighChem is committed to the R&D, contracted production and trade of fine chemical products for both China and Japan. The company’s business covers various fields, such as life science, pharmaceutical, farm chemicals, electrochemical, liquid crystal intermediate, painting, resin, food additives, water treatment agent, chemical engineering, and energy fields. We have built long-term cooperative relationship with hundreds of chemical enterprises and research institutes in China. With the rapid development of China’s technology, HighChem will develop new markets and provide customers advanced organic chemistry technology and practical environmental protection equipment. Beijing Booming HighChem Technology Co., Ltd., the wholly-owned subsidiary of HighChem Company Limited, changed its name in February 2012 from the former HighChem Beijing Office which was established in October 2008. The company is specialized in the technology promotion for coal chemical industry, petrochemical industry, and natural gas chemical industry, etc. The main business covers R&D of chemical engineering technology, technology licensing, project services and sales of chemical products. We also conduct sales of related catalyst and special equipment and provide technical support. At present, the company has the industrialized Coal to Ethylene Glycol technology (CTEG), and PTMEG, polypropylene, butanol and octanol, acrylic acid, PTMEG, etc. Coal to Ethylene Glycol (CTEG) is the the key technology of the company. Based on 20 years’ research achievements of UBE Industries, the technology has obvious advantages in the world. It has achieved industrial production in Xinjiang Tianye Group on January 6, 2013. By now, the CTEG production equipment has run for a year and the monthly production load achieved more than 80%. It is the first high load CTEG equipment in China. 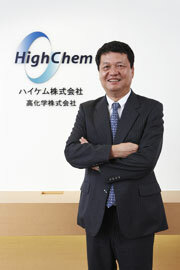 HighChem Group will provide customers all round services from the planning of industrial chain, technology selection, technology package, technical training and service, to catalyst supply, product sales and logistics solutions, with over 20 years accumulation and efficient resources integration capability in the chemical industry in China and Japan. We will make efforts to achieve resonance and win-win with all the friends in the chemical industry! We love chemistry and seek to establish true reconciliation without discrimination through our company activities in Japan and China, to contribute to the development of the chemical industry both in Japan and China. We provide all customers satisfaction and benefit to realize co-existence and co-prosperity, to establish HighChem as a brand in the chemical market. We provide our employees with job satisfaction and fair opportunities to create a business culture that inspires the staff to achieve their goals. We strive to be good corporate citizens in a sound, morally healthy society; to maintain safety, health, and the environment; and to take all measures to comply with the laws and regulations as they relate to the company. We continue to be a creative and challenging company that looks forward to the future, aspires to continuous growth, and constantly develops new products and markets. 1982 Graduated from Dept.of Organic Chemistry, Hunan University. 1991 Graduated from Master Course, School of Life Chemistry, Tokyo University. 1991 Entered Mitsubishi Chemical Corporation, Tsukuba Institute. 1994 Established 21th century Co. Ltd. the predecessor of Highchem Co. Ltd.
1998 Established Highchem Co. Ltd. and took up the position as President. 2006 Industry adviser of Chongqing government. 2007 Visiting professor of Hunan university. Mr. Taka Ushio (Gao Chao in Pinyin) was one of the first college graduates after China resumed the university entrance examination. After graduation, he continued his study in Japan and then started his own business. Though he lived abroad, he would not forget to serve his motherland. HighCHem Company Limited, which was founded by Mr. Taka Ushio, has established long-term relationship with multiple Chinese research institutes and companies. HighChem also set up branch companies and joint ventures in China. As a visiting professor in his alma mater – Hunan University, Mr. Taka Ushio set up scholarships for the students, and he also shared his entrepreneurial experience with them.